GIGABYTE Thin-Mini-ITX motherboards are the ideal platform for today's All-in-One, small form factor and slim profile PCs. Offering a full featured PC experience in a minimal device footprint, GIGABYTE Thin Mini-ITX motherboards are 43% thinner than traditional Mini-ITX designs. 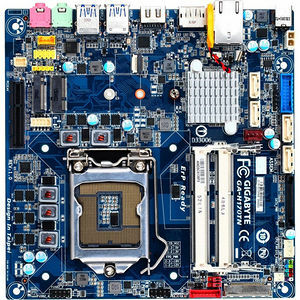 Complying with the latest Thin Mini-ITX guidelines, GIGABYTE Thin Mini-ITX motherboards offer additional flexibility making them suited to broad range of innovative PC designs. GIGABYTE Thin Mini-ITX motherboards feature a selectable power driver allowing for both 3.3v and 5v configurations. This brings additional flexibility for LVDS panels that require both 3.3v and 5v drivers. Voltage settings are configured via an onboard jumper. GIGABYTE Thin Mini-ITX motherboards offer flexible backlight power delivery with both 12v and 19v options available via onboard jumpers. This enhances compatibility with the wide range of backlit displays available today. Offering additional flexibility for system DC voltage input, GIGABYTE Thin Mini-ITX motherboards offer a broad voltage range of 12v to 19v, eliminating compatibility issues with many traditional IPC designs. GIGABYTE Thin Mini-ITX motherboards are equipped with a X4 PCI Express expansion slot providing up to 25W of power and easy integration of TV tuner, video capture or RAID cards with a compatible riser card. Saves your valuable time when create and edit video, synchronize it with other devices, and share it-at home and on the internet. Intel Quick Sync Video uses hardware on the processor, instead of software, to accelerate video encoding. GIGABYTE Ultra Durable motherboards are equipped with solid capacitors which provide the stability, reliability and longevity essential to meet the power needs of high-end processors and other components running today's most demanding applications and games. GIGABYTE motherboards boast SuperSpeed USB 3.0 technology made possible through an additional onboard host controller. With superfast transfer rates of up to 5 Gbps, users are able to experience a theoretical 10x improvement over USB 2.0. Additionally, backwards compatibility with USB 2.0 assures users of long term use of their legacy USB 2.0 devices. Microsoft DirectX 11 provides eye-popping 3D visuals found for today's latest PC games and is designed to be more efficient, leverage the power of today's multi-core processors, and provide support for sophisticated shading and texturing techniques such as tessellation. Selected GIGABYTE motherboards feature DisplayPort, a next generation graphics display interface that delivers up to 10.8 Gbps of bandwidth over standard cables, providing billions of colors with the fastest refresh rates and the greatest color depths.